The March 22, 2019 auction of Chinese Ceramics and Works of Art at Christie's New York is highlighted by a wonderful "money tree," a fine "Number 3" jun jardiniere, a celadon cong-form vase, a scary enamel and bisquit seated luohan, a Daoist Immortals "birthday" panel, a "peony scroll" bottle vase, a gilded greystone figure of Buddha, and a ritual wine vessel. Lot 1605 is a rare and large bronze and green-glazed "Money Tree" from the Eastern Han Dynasty, 1st-2nd Century AD. The green-glazed reddish pottery base is molded in the form of two beasts crouching on top of one another, supporting a cylinder into which fits the slender trunk of the bronze tree, which is fitted with four tiers of flat openwork plaques forming the main branches emanating from the central rod. The branches are embellished with smaller reticulated plaques which hang at right angles. The central rod is surmounted by a phoenix with detachable outstretched wings, facing an intricate scrolling floral stem. The cataogue has an essay on the "Money Tree" by Robert D. Mowry, the Alan J. Dworsky Curator of Chinese Art Emeritus, at Harvard Art Museums and a senior Christie's consultant. 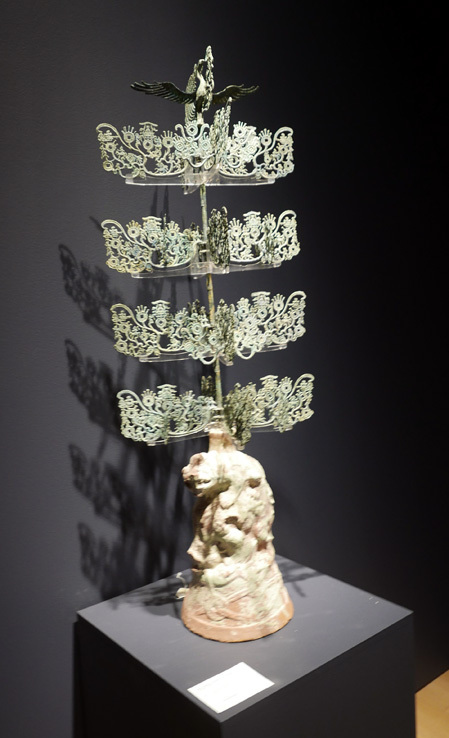 "Among the many types of luxury burial goods newly introduced during the Han dynasty (206 BC–AD 220), the money tree ranks among the most visually spectacular. Such money trees were especially popular in central Sichuan province during the Eastern Han period (AD 25–220), their popularity continuing into the Three Kingdoms period (AD 220–280), particularly in the southwestern state of Shu (AD 221–263). Termed in Chinese a qianshu —or occasionally a yaoqianshu —a money tree comprises a central bronze pole, or trunk, to which are attached a series of cast bronze “branches” organized in tiers, each tree typically with three to six tiers of branches; this bronze tree has four tiers. A phoenix with outstretched wings and a long, segmented tail comprising five strands stands on top of the tree. The central trunk typically rises from a brick-red earthenware base molded in the form of one or two animals and covered with emerald-green or caramel-brown lead-fluxed glaze; the base of the present example is modeled in the form of two crouching beasts, one on top of the other, and it sports a green lead glaze , now degraded and showing a silvery iridescence. Such money trees are rare in collections outside of China, lending this beautiful, well-preserved example special importance. "Each tier of the present money tree has four main branches, which are set at right angles to each other and, given the Han interest in directional symbolism, are oriented toward the points of the compass. Moreover, a smaller, subsidiary branch projects outward at a ninety-degree angle from the center of each main branch. Cast with openwork designs, each branch, whether main or subsidiary, includes a wealth of real and mythical animals but always features Xiwangmu, the Queen Mother of the West, seated on a throne supported by a dragon and a tiger as the central motif and always boasts several coins from which rays project around the periphery, likely rays of light. The coins are wuzhu coins—i.e., the familiar circular coins with a square opening at the center—which were minted in Sichuan province and which were the standard coin of the realm from 118 BC until AD 618. "Money trees embody wishes for the continued well-being and prosperity of the deceased’s spirit in the afterlife as evinced by the coins on each branch. Of greater importance, the representation on each branch of Xiwangmu, the most important of the deities venerated during the Han, attests to the hope that she will assist the deceased in gaining immortality, as she was believed to have the ability to dispense long life, even eternal life. The presence of the phoenix at the top suggests that the tree represents the magical fusang tree, which was believed to grow in the Eastern Sea and which, according to ancient mythology, was the perch on which a golden sun-bird alighted each morning, bringing light and warmth to the new day. "The origin of the money tree remains obscure, though some scholars cite a possible descent from the bronze sculptures of trees recovered from the ancient site of Sanxingdui, also in central Sichuan province. 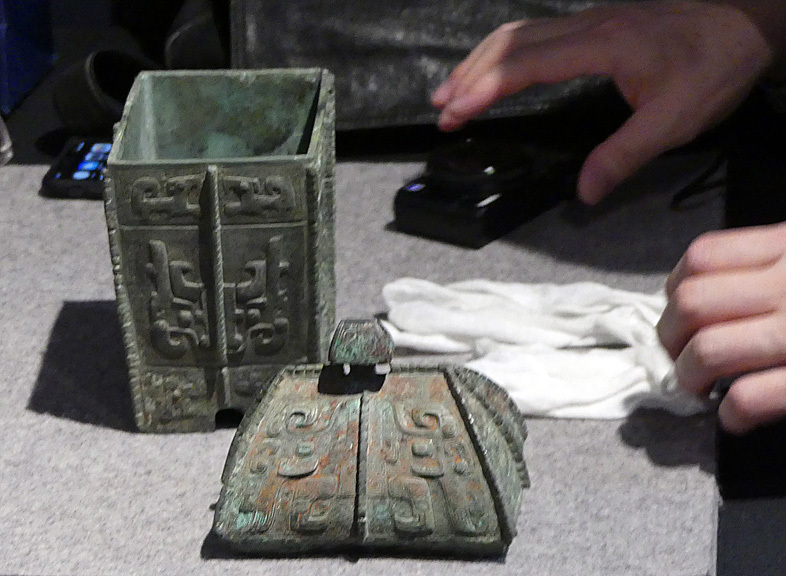 Scholars note that in the late 1980s, eight cast-bronze sculptures of trees - termed shen shu ('sacred trees', 'holy trees', or 'divine trees') by modern archaeologists - were excavated from the Sanxingdui site at Guanghan in Sichuan province. 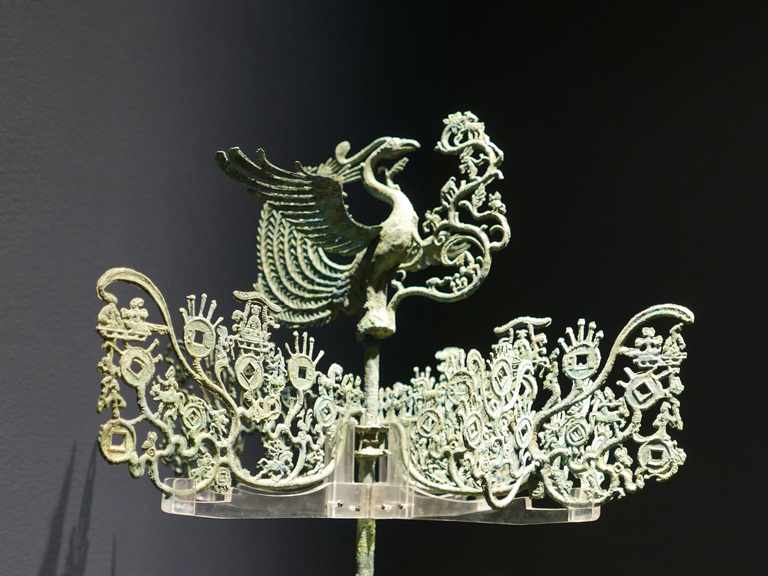 The majority of the hundreds of bronze sculptures and vessels, jades, and other artefacts recovered at Sanxingdui date to the twelfth and eleventh centuries BC; though, the exact date of the bronze trees is uncertain, they likely were produced at that same time. Designated Tree Number 1, the tallest of the eight bronze trees measures 3.96 m., or thirteen feet, in height, implying that the tree sculptures were both very important and highly symbolic to the people who made them;6 indeed, they likely were considered sacred. Tree Number 1 has nine pendulous branches; perched on a blossom, a bird appears at the crest of each downward-curving branch, while a fruit or flower hangs from the lower end of each branch. Modern archaeologists assume that the trees represent the magical fusang tree and further assume that the nine birds represent deities associated with the sun, though no inscriptions or other written records from the period survive to substantiate this assertion. "If they indeed date to the twelfth or eleventh century BC, the Sanxingdui bronze trees were created more than 1,000 years before the Eastern Han money trees. Intriguingly, both Sanxingdui bronze trees and Eastern Han money trees were produced in the same general area—in central Sichuan province. Without written records from the people who made them, however, it is impossible to know whether or not a connection exists between the Eastern Han money trees and the much earlier Sanxingdui bronze trees. It of course is possible that people of the area maintained a tradition of sacred trees in the long intervening period, even if they didn’t create sculptures of them. "In terms of artistic predecessors closer in time to the money trees, the authors of the Kaikodo Journal in 1996 noted the similarity in general appearance of Eastern Han money trees to the depiction of fusang trees on a painted lacquer chest recovered from the tomb of Marquis Yi of Zeng (c. 433 BC), near Suizhou, Hubei province, commenting that the '… representations of heraldic trees, stiff and symmetrical, [are] flanked at the top by birds or beasts. Those trees are depictions of the Fusang Tree from which the Archer Yi shot down nine contender suns. The spiky orbs hanging from the Fusang trees and the representations of coins on the Sichuan money trees are strikingly similar.' From the mid-second century AD and roughly contemporaneous with the money trees from Sichuan province, bas-relief carvings at the Wu Family Shrines in southwestern Shandong province include highly stylized depictions of fusang trees, demonstrating widespread interest in such trees throughout China during the Eastern Han. "Securely dated on the basis of archaeological excavations, money trees are known to have been used only in Sichuan province and only during the Eastern Han period and into the succeeding Three Kingdom period, and thus they can be securely dated to the first and second centuries AD, with a few perhaps coming from the third. Indeed, the coins depicted on the trees accord with the wuzhu coins in circulation at the time, and the representations of Xiwangmu are akin to those on ceramic tiles recovered from Eastern Han-period tombs from Sichuan. "Each branch of the tree was separately cast in a two-face mold using the lost-wax process. The branches are very thin and bear the same decorative motif on each side; in fact, X-ray analyses of branches from other money trees have revealed that the patterns on the two sides line up exactly, attesting to a perfect registration, or alignment, of the mold faces. At the 'inside' end of each branch is a hook which secures the branch in place when inserted into a mortice, or opening, in the bronze tree trunk. With the branches set at right angles to each other and with the branches of each tier placed above each other, the weight is evenly distributed along the tree trunk, and the design is symmetrical and harmonious. The most famous of all money trees is the one excavated in 1983 at Wanfuzhen, Guanghan in Sichuan province and now in the Guanghan County Cultural Center. The best known money trees in public collections in the United States are those in the Asian Art Museum, San Francisco (1995.79.a-.dd),13 the Minneapolis Institute of Arts (2002.47A-RRR),14 the Portland Art Museum, Portland, Oregon (2004.114.9A–C),15 and the Princeton University Art Museum, Princeton, New Jersey (1999-79)." The lot has an estimate of $100,000 to $150,000. It sold for $350,000 including the buyer's premium as do all results mentioned in this article. The auction total was $19,319,875. Lot 1723 is a "Number 3" jun gardiniere from the Yuan-Ming period in the 14th-15th Century. It is 10 3/4 inches high. The catalogue entry notes that "The body is molded with six lobes below the correspondingly lobed everted rim, and the exterior is covered with a lavender-blue glaze shading to brilliant purple color. The interior and the rim are covered with a pale milky-blue glaze thinning to mushroom, and there are five drainage holes piercing the base, which is dressed in a thin brown glaze on the underside and incised with the number san (three)." "Among the most famous of Chinese ceramics, Jun wares fall into two typological groups. The first, generally regarded as earlier and often termed classic Jun, includes such food- and wine-serving vessels as dishes, bowls, cups, small jars, and the occasional bottle or vase. The second category, termed Numbered Jun ware, or Guan Jun, includes vessels that not only are generally much larger than classic Jun wares but are almost exclusively flower pots and associated drip-basins. So revered was Jun ware that connoisseurs of the Ming dynasty (1368–1644) ranked it among the 'Five Great Wares of the Song Dynasty', alongside Ding, Ru, Guan, and Ge wares. 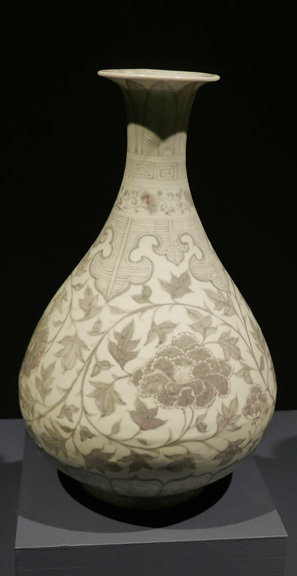 Even so, those Junwares described in early Ming records seem to include only classic Jun pieces, as no mentions in those records suggest the large vessels that were made as flower pots; by contrast, depictions of flower pots and basins, seemingly of Numbered Jun ware, occasionally appear in Ming and Qing paintings. "The general dating of classic Jun ware is comparatively well understood, even if an exact chronology has yet to be firmly established, but the category of Numbered Jun ware has sparked much controversy in recent decades. Classic Jun wares of the Northern Song (960–1127) and Jin (1115–1234) periods sport a robin’s-egg blue glaze sometimes enlivened with suffusions of lavender or purple from copper filings sprinkled or brushed on the surface of the glaze before firing. Following a tradition set during the Qing dynasty (1644–1911) some specialists assert that numbered pieces were produced at the same time as classic Jun wares, but many other scholars now favor a fourteenth- or fifteenth-century date for the numbered examples - that is, a date in the Yuan (1279–1368) or early Ming period. Standing apart from the subtly colored monochrome glazes of most Northern Song and Jin ceramics, the exuberant purple glazes of Numbered Jun wares find aesthetic kinship in the copper-red glazes of the early Ming. Their use as pots for plant cultivation differentiates numbered pieces from classic Jun wares, just as their large size not only distinguishes them from classic wares but links them to fourteenth- and fifteenth-century ceramics from other kilns.Moreover, the formalized floral shapes - in particular, the barbed and foliated rims with their thickened edges - find parallels in those of fourteenth- and fifteenth-century vessels in lacquer and metalwork; more to the point, the formalized shapes are akin to those of ceramics produced at other kilns, particularly to blue-and-white porcelains produced at Jingdezhen in the fourteenth and early fifteenth centuries. "Perhaps the most compelling argument for a fifteenth-century date, however, is the technique of manufacture of this jardinière and other Numbered Jun vessels; rather than being turned on a potter’s wheel or shaped over a so-called hump mold, such vessels were formed with double-faced, press molds. Although Chinese potters had employed single-faced, or hump molds since antiquity, the use of press molds is not otherwise documented before the fourteenth century, when it came to be used at Jingdezhen, in Jiangxi province. Such double-faced molds allow the foliations (or barbs) and indentations of the rim to continue down the walls of the pot with the perfect placement and symmetry that hand crafting would seldom permit. Beginning in the late fourteenth and continuing into the fifteenth century, potters delighted in continuing those foliations / barbs and indentations into the footring, so that the footring perfectly echoes the rim of a barbed or foliated flower pot. This feature finds parallels in the elaborately molded forms of blue-and-white porcelain stemcups and brush washers produced during the Xuande period (1425–1436); in fact, this technical relationship and its happy aesthetic effects signal that Numbered Jun pieces are unlikely to have been produced earlier than the Xuande period, though they possibly could have been produced as late as the mid-fifteenth-century, during the Chenghua reign (1465–1487). "Just as the precise dating of Numbered Jun ware remains vexingly problematic, so does its place of manufacture. As Rosemary Scott has aptly explained, “Stonewares with Jun-type glazes have been found at the Northern Song Ru ware site at Qingliangsi, Henan province, but the eponymous site for normal Jun wares is Juntai in Yuxian, Henan province, which was excavated in 1964 and 1974,and was located just inside the gate in the northern part of the town of Yuzhou. Yuxian was a very active ceramic producing area from the Tang to the Ming dynasty, as evidenced by the discovery of more than 100 kilns in the area. However, Jun-type wares were also made at kilns in other parts of Henan, as well as in Hebei and Shanxi provinces. Everyday Jun wares such as bowls, dishes, cup-stands, vases and ewers have been found at these sites and also in tombs and hoards which can be dated to the Song, Jin and Yuan periods. These include both monochrome blue and copper splashed wares. The dating of these everyday wares is relatively straightforward. "The use of press molds that permitted the continuation of the foliations of the rim through the walls of the flower pot and into the footring provides technical evidence that Numbered Jun pieces must date to the fifteenth century. Given that Numbered Jun pieces are exceptionally rare, that they are extraordinarily homogeneous in style and technique of manufacture, and that most have, or once had, documentable palace associations, it is tempting to ask if all such pieces might have been made at a single kiln as part of one large commission for the palace, perhaps to celebrate the dedication of a new complex within the Forbidden City, whose origins of course date to the early fifteenth century. As yet, no evidence has yet come to light to substantiate this speculation, but a thorough scrutiny of palace archival records might one day prove revealing. "Controlled kiln excavations one day will settle the much-debated question of the dating of Numbered Jun ware; such archaeological investigations doubtless eventually will identify the kilns that produced the numbered wares and will clarify the relationship between numbered and classic wares. As flower pots and associated basins were made for use by the living and thus seldom appear among tomb furnishings, archaeology probably will shed less light on the identity of the clients for whom the vessels were made, but perhaps a detailed search of palace archives one day will reveal a long-forgotten commission. "A closely related jardinière, also with the number three inscribed on the base, appears in the collection of the National Palace Museum, Taipei; the Taipei Palace Museum collection also includes two additional flower pots of similar shape including one with azure blue glaze, impressed with the numeral five, and one with a variegated azure and purple glaze, impressed with the numeral seven. The collection of the Victoria and Albert Museum, London, includes a similar azure-purple-glazed planter with impressed numeral three on its base (C.35-1935). Two similarly shaped jardinières, each with a variegated azure-purple glaze, each inscribed with the numeral three, and each formerly in the collection of J. Pierpont Morgan (1837–1913), New York, sold at Sotheby’s, London, on 25 March 1975 (lots 224 and 225). The similarly shaped and glazed jardinière with the number four inscribed on its underside and once owned by renowned British collector George Eumorfopoulos (1863–1939) was sold at Sotheby’s, London, in 1940.18 A similarly shaped and glazed planter in the Metropolitan Museum of Art, New York (45.42.5), bears the inscribed numeral six on its base. "The largest and most diverse collection of Numbered Jun wares outside of the National Palace Museum is in the Harvard Art Museums, Cambridge, MA. Given in 1942 by Ernest B. Dane (1868–1942) his wife, Helen Pratt Dane (1867–1949), of Brookline, Massachusetts, the Harvard Numbered Jun ware collection includes forty-one complete jardinières and one fragmentary jardinière modified to serve as a censer. In addition, the collection includes sixteen drip-basins, one zun-shaped flower vase, and one fragmentary zun-shaped vase modified to serve as a censer. Of the forty-one complete jardinières, thirteen are hexagonal with foliated rims—that is, in the shape Chinese collectors traditionally call kuihuashi. Among the hexagonal flower pots, two are virtually identical to the present jardinière, each with variegated azure and purple glazes on the exterior and each with the numeral three inscribed on the base (numbers 1942.185.9 20 and 1942.185.10 21). The first-mentioned Harvard jardinière (1942.185.9) has incised into the glaze on its base a Qing-palace inscription reading Chonghuagong Cuiyunguan yong, which might be translated 'Palace of Double Glory, used in the Lodge of Emerald Clouds,' indicating that the vessel formerly was part of the Imperial Collection and was housed in the Forbidden City." The lot has an estimate of $2,500,000 to $3,500,000. It sold for $3,015,000. Lot 1604 is an impressive cast bronze Ritual Wine Vessel, known as Fangyi, from the Late Shang Dynastry, 13th-11th Century BC. It is 9 inches high. It was once owned by Raymond A. Bidwell and then the Springfield Museums in Massachusetts. which deaccessioned it and it was offered at Christie's New York in March 2013. The Springfield Museums is the largest cultural attrraction of western Massachusetts, according to the catalogue and comprises four museums - the Sprinfield Science Museum, the Lyman and Merrie Wood Museum of Springfield History, the George Walter Vincent Smith Art Museum and the Michele and Donald D'Armour Museum of Fine Arts. The lot has an estimate of $1,500,000 to $2,500,000. It failed to sell. Lot 1619 is a gilded Buddha, Northern Qi Dynasty, AD 550-577. It is 27 3/4 inches high. The catalogue notes that "the slender, elegant figure is shown standing on top of a socle with right hand raised inabhayamudra, in the attitude of 'do not fear', and the left hand held in varadamudra, the gesture of gift-giving. He wears a simplified sanghati bearing traces of patchwork pattern that falls to above his feet and clings to the contours of his body. The face is carved with a serene expression, and the hair and rounded ushnisha are painted black while the remainder of the figure is covered in gold leaf, with traces of red pigment on the mouth and black pigment on the eyes and brows." It was included in the Important Chinese Works of Art from the Arthur M. Sackler Collection auction at Christie's New York, 1 December 1994, lot 166. "Presented in the guise of a monk, this magnificent sculpture, which dates to the Northern Qi period (AD 550–577), represents a Buddha as indicated by the robes, ushnisha, benevolent countenance, distended earlobes, and webbed fingers. The ushnisha, or cranial protuberance atop the head, symbolizes the expanded wisdom that the Buddha gained at his enlightenment, and it serves as the Buddha’s diagnostic iconographic feature as only Buddhas possess an ushnisha. The gilded surfaces not only make the sculpture appropriate for representing a deity but symbolize the light that, according to the sacred texts, or sutras, radiates from his body. "'Buddha' means 'the Enlightened One;' he is an individual who has attained enlightenment and has entered into nirvana. In this sculpture, the Buddha is standing and holds his right hand in the abhaya mudra, a preaching gesture in which the hand is raised, palm outward, in the attitude of ‘do not fear’. (A ritual hand gesture, a mudra symbolizes a particular action, power, or attitude of a deity.) He holds his left hand in the varada mudra, or gift-giving gesture, in which the hand is lowered, palm outward. This combination of mudras - often shortened to read abhaya-vara mudra - indicates that the Buddha is preaching. Many different Buddhas hold their hands in the abhaya-vara mudra; even so, a Buddha with hands so positioned, the fingers elegantly arrayed and pointing straight up and straight down but without fingertips and thumb touching to form a circle, is typically identified as the Historical Buddha Shakyamuni (traditionally, 563 BC – 483 BC), suggesting that this image likely represents Shakyamuni. "As described in the sutras, the Buddha wears three distinct robes, though not all are visible in every sculpture or painted image; in this sculpture, the outer robe fully cloaks the figure, for example, with the result that the other robes are mostly concealed. Known in Sanskrit as the kasaya or ticivara, the Buddha’s three robes comprise the sanghati, uttarasanga, and the antaravasaka. Not tailored, each robe is a long, rectangular piece of cloth that is wrapped around or draped over the body in a prescribed fashion. Sometimes likened to a dhoti or sarong, the antaravasaka is an inner robe that covers the lower portion of the body; wrapped around the waist, it typically hangs from to the ankles, covering the hips and legs. Also an inner robe, the uttarasanga covers the left shoulder and crosses the chest diagonally but leaves the right shoulder and right arm bare; it covers the antaravasaka, except for its lowermost edge, and is itself covered by the sanghati, which is the outer robe that usually is the most visible and distinctive of the three robes. Additionally, there might be a kushalaka, a cloth or cord worn around the waist to hold the antaravasaka and uttarasanga in place; more rarely, those inner garments may be secured in place by a samakaksika, or buckled belt. "In this sculpture, the antaravasaka, the dhoti-like garment, is visible only at the Buddha’s ankles, where it projects below the edge of the outer robe. Completely covered by the outer robe, the uttarasanga also is not visible in this sculpture. Most prominent of all, the sanghati, or outer robe, which has been embellished with applied gold, covers both shoulders and the chest and then flows gracefully over the entire body, terminating just above the ankles in a wide, U-shaped configuration. The outer edges of the sanghati loop over the arms and descend along the sculpture’s sides, suggesting a cape. Lacking a kushalaka, or cincture around the waist, the drapery flows smoothly and elegantly over the body, clinging tightly enough to reveal the body’s presence and to suggest its form, from the broad shoulders and narrow waist to the swelling hips and columnar legs, but not so tightly as to reveal its anatomical structure in detail. "This sculpture originally would have stood on a carved lotus base of which only the 'seedpod' at the bottom of this sculpture remains today; with flat top and slightly concave sides, the generally triangular seedpod would have been set within the central cavity of a circular lotus base on top of a square plinth, anchoring the sculpture in an upright position. Rising from its lotus base, this majestic, gilt stone sculpture originally stood on an altar; it might have appeared alone but it more likely was part of a group of figures. "Hierarchically scaled and symmetrically arranged, such a group would have included the the Buddha at the center flanked on either side by a bodhisattva, perhaps with a monk or disciple tucked between the Buddha and each bodhisattva, and perhaps with a guardian figure at each outer edge of the assemblage. A Sui-dynasty (AD 581–618) bronze altarpiece in the collection of the Museum of Fine Arts, Boston (22.407) suggests the context in which this sculpture originally appeared, as does the late seventh or early eighth-century, gilt bronze Maitreya altar group in the collection of the Asian Art Museum, San Francisco (B60 B8+). "If presented as the central deity in a grouping, Shakyamuni likely would have been accompanied by Bodhisattva Manjushri, the bodhisattva of transcendent wisdom, and Samantabhadra, the bodhisattva of Buddhist practice and meditation, thus forming a Shakyamuni Triad. (Meaning 'enlightened being', bodhisattvas are benevolent beings who have attained enlightenment but who have selflessly postponed entry into nirvana in order to assist other sentient beings in gaining enlightenment and thus release from the samsara cycle of birth and rebirth.) Alternatively, as he is regarded as the Buddha of the Future and thus the successor to Shakyamuni, the Bodhisattva Maitreya might have accompanied Shakyamuni in place of Samantabhadra or Manjushri. If disciples appeared in the grouping, they likely would have been the youthful Ananda and the elderly Mahakasyapa, Shakyamuni’s favorites. "In excellent condition and amazingly complete - retaining its original head, arms, body, legs, feet, and lotus-seedpod base - this sculpture dates to the Northern Qi period (AD 550–577). The sculpture’s majestic, columnar stature is entirely in keeping with its Northern Qi date, as are the large hands, the simple, clinging robe, and the treatment of the rounded chest, which lacks both a division of the pectorals and a distinction between chest abdomen. (The disproportionately large hands likely served to emphasize the mudra and associated symbolism of teaching.) The unembellished cylindrical neck, which is typical of Northern Qi sculptures, stands in contrast to the fleshy necks with three strongly articulated folds that would appear during the Sui dynasty (AD 518–618) and then would become characteristic in sculptures from the Tang dynasty (AD 618–907). The rectangular face with relatively small eyes set in shallow sockets, the large domical ushnisha, and the depiction of the top of the head with shaven pate rather than with wavy locks or small snail-shell curls of hair also are all standard features of Buddhist sculptures from the Northern Qi period. In addition, the elongated ears with distended but flat, unmodulated, unpierced lobes are characteristic of the Northern Qi style. Moreover, the placement of the arms close to the body, with a lack of open space between arms and torso, is a standard feature of Northern Qi sculptures, the interest in such piercing of the stone occurring in the Sui and flourishing in the Tang. "Although modest drapery folds, whether incised or carved in shallow relief, enliven the robes of most Northern Qi stone sculptures of the Buddha, a few such sculptures - particularly ones excavated at the site of the Longxingsi Temple at Qingzhou, Shandong province - lack such folds, the robes clinging tightly to the figure’s body and flowing gracefully from shoulders to ankles, unimpeded by incised or carved folds. In the treatment of its drapery, the present sculpture shows a remarkable kinship to those from Qingzhou. As amply demonstrated by the Qingzhou sculptures, however, such sculptures originally were fully painted or gilded - as in the case of the present sculpture - so the stone surfaces in fact were embellished, even if not with incising or carving. "Published in London already in 1978, this sculpture had been in the West at least twenty years before the discovery and excavation of the Qingzhou sculptures in 1996-97. Close as it is in appearance to those sculptures, this impressive sculpture is not from that location, though the similarity in style suggests that it might well have been produced in the same general area as the Qingzhou sculptures, perhaps at another site in Shandong province or a little farther to the west, in Hebei province. Even so, subtle features differentiate the present sculpture from those recovered at Qingzhou. The present sculpture has a shaven pate, for example, whereas most Qingzhou images of the Buddha have small snail-shell curls of hair; in addition, this Buddha’s face is rectangular, but those of the Qingzhou sculptures are slightly rounded (even if not as round and fleshy as those of Tang sculptures). The hands of the Qingzhou Buddhas generally are in proper scale to the bodies, rather than disproportionately large, and the fingers are more delicately arrayed, occasionally with fingers slightly flexed. Nonetheless, the remarkable similarity in style and general appearance establishes this sculpture’s Northern Qi date, demonstrates that one variant style lacked incised or carved drapery folds, and documents that some rare stone sculptures were embellished with applied gold. "This majestic image represents a Buddha in the act of preaching, likely the Historical Buddha Shakyamuni. Simply yet brilliantly composed, this exquisite sculpture focuses attention on the Buddha’s face, with its serene countenance and compassionate expression, and on his hands, with their preaching mudras. In perfect harmony, the elegant style and clear statement of purpose - the preaching of wisdom and compassion - combine to make this a great masterwork of Chinese Buddhist sculpture." The lot has an estimate $1,200,000 to $1,800,000. It sold for $1,455,000. Lot 1624 is an elegant, copper-red-decorated "Peony-Scroll" bottle vase, Yunuchunping, Hongwu Period, 1368-1398. It is 13 1/4 inches high. It was once in the collection of the Idemitsu Museum of Art in Tokyo. Although copper oxide was first used to produce red on high-fired ceramics in the Tang dynasty, its use was limited to a few stoneware pieces with a monochrome copper red-glaze and a larger number of vessels with designs in copper red. This limited use of copper-red decoration continued into the Song dynasty when the first examples of copper-red glazed porcelain appeared. Due to the difficulty of working with copper oxide its use continued to be limited until the Yuan dynasty when there was a concerted effort to master the material. It was during this period that the potters of Jingdezhen experimented with several different techniques in the application of copper red - splashes, reserved decoration and painted decoration. On vessels with reserved decoration, the design was incised into the body of the vessel and the copper red applied as a band that avoided the design. Two of the more successful examples of this type of decoration are the two Yuan-dynasty yuhuchunping illustrated in The Complete Collection of Treasures of the Palace Museum - 34 - Blue and White Porcelain with Underglazed Red, Hong Kong, 2000, pp. 206-207, pls. 191 and 192. Too often, the copper red, due to its fluidity, bled into the design, and eventually the method of painted decoration is the one that came to predominate during the early Ming dynasty. It was during the Hongwu period (1368-1398) of the early Ming dynasty, that the potters at Jingdezhen were able to more successfully control the fluidity of the copper red, resulting in more reliable results in its application and firing. It was also during this period that the decoration in copper red mirrored that executed in cobalt, or underglaze blue, as did the shapes of the vessels. The shape of the yuhuchunping with its pear-shaped body that tapers to the narrow neck that rises to a flared mouth informed the manner of decoration - a wide band of decoration on the body between narrow decorative bands below and on the neck above. On both the underglaze blue and copper-red-decorated vases of this shape, the decoration most often consists of a wide band of flower scroll above a band of petal lappets, and narrow bands of trefoils (cloud collar), classic scroll and key fret below upright plantain leaves on the neck. Examples are also known with 'The Three Friends of Winter' forming the main band, as seen on two copper-red-decorated yuhuchunping illustrated ibid., pp. 214-16, pls. 199 and 200. Of the flower scroll-decorated yuhuchunping, the flowers represented are usually peony, lotus or chrysanthemum. It is the first of these flower scrolls that decorate the present vase, as well as two copper-red-decorated examples, also illustrated ibid., pp. 212 and 213, pls. 197-98. Four other vases of this shape, similarly decorated in copper red with peony scroll are illustrated in Mayuyama, Seventy Years, vol. 1, Tokyo, 1976, p. 241, pls. 721-724. All of these have a cloud collar formed by small joined trefoils pendent from the decorative bands at the base of the neck. The cloud collar on the present vase is a very rare variant, as it is larger and composed of large trefoils alternating with smaller trefoils, all filled with hatched lines radiating from a central rib. This rare variant of cloud collar can be seen on two ewers of Hongwu date, one decorated in copper-red with chrysanthemum scroll, in the Victoria and Albert Museum, illustrated by Soame Jenyns in Ming Pottery and Porcelain, London, 1953, and another in blue and white with peony scroll illustrated in Chinese Ceramics in the Idemitsu Museum, Tokyo, 1987, col. pl. 151. It has an estimate $300,000 to $500,000. It sold for $350,000. Lot 1617 is six painted pottery funeral tiles, Jin Dynasty, 1115-1234, 12 1/8 by 10 inches each. The lot has an estimate of $30,000 to $50,000. It sold for $32.500. 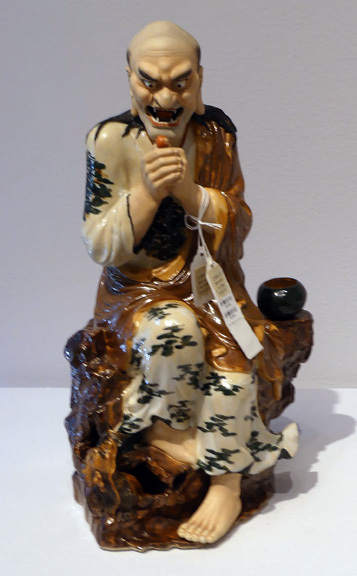 Lot 1848, "Seated Luohan," polychromed enameled and bisquit, seal of Zeng Longsheng, Republic Period, 16 1/2 inches high. Zeng Longsheng (1901-1964) was a celebrated potter at the Jingdezhen kiln. The lot has an estimate of $10,000 to $15,000. It sold for $20,000. 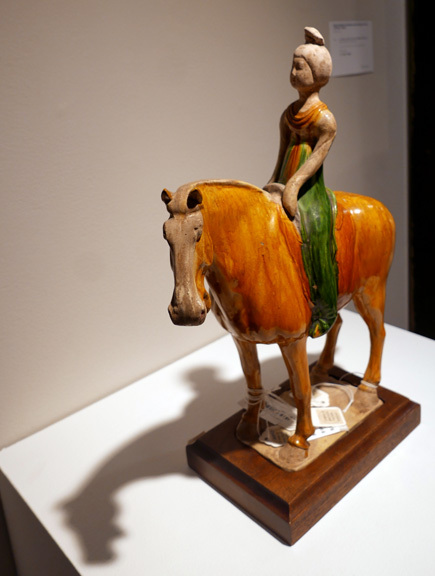 Lot 1616, Figure of an Equestrienne, Sancai-glazed pottery figure, Tang Dynasty, AD 618-907, 16 1/2 inches high. It was formerly owned by the Cincinnati Museum of Art and Michael B. Weisbrod Inc. of New York. It has an estimate of $20,000 to $30,000. It failed to sell. 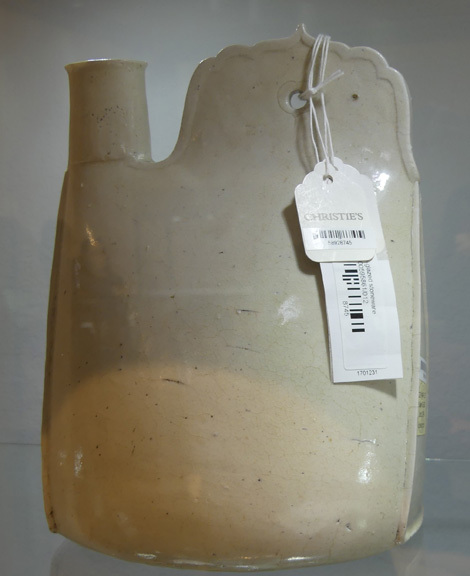 Lot 1736 is a Cockscomb flask of glazed white stoneware from the Liao Dynasty, 10th-11th Century. It is 9 1/8 inches high. It has an estimate of $40,000 to $60.000. It sold for $40,000.